China's position as the world's major supplier of low-cost labour could be eroded by an ageing population, the authorities have warned. There are six workers for each retiree in China, but that could narrow to two-to-one between 2030 and 2050, the National Committee on Ageing says. Officials say the economy will suffer as there will be fewer people working and more older people to support. China's low-cost labour has provided the base for its economic growth. Improved living standards and strict family planning laws have contributed to the demographic change. "We might encounter the heaviest burden especially after 2030, when the demographic dividend is set to end," Yan Qingchun, deputy director of the office of the ageing committee, told China Daily. "With fewer people of working age and more pressure in supporting the elderly, the economy will suffer if productivity sees no major progress," he added. The BBC's Michael Bristow, in Beijing, says the change is partly because of improvements in healthcare and China's one-child policy, but also because fewer couples are having children. China currently has six workers for every retired person, according to the latest report. 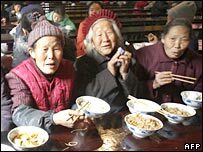 But estimates say that by 2050, the number of over-60s in China will climb to 437 million - more than a quarter of the population. That would mean two workers to support every retiree. Zhang Kaidi, director of the China Research Center on Ageing, told China Daily that the country is "not prepared" for the problems presented by an ageing population. He warned that the authorities need to "allocate more funds to build a comprehensive and efficient system of support for the elderly". Changes in the social structure in China have often meant a removal of traditional sources of help for the elderly and fewer than 5% of older people in rural areas receive a pension.